Finishing the body and the neck with Danish Oil saves time, gives good results and can therefore only be recommended. 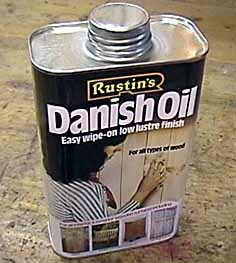 Danish Oil is an oil-varnish blend. It cures to a satin sheen and is much more protective than boiled linseed oil while being just as easy to apply. Instead of buying Danish Oil you can make your own by mixing one part of varnish, one part of boiled linseed oil and one part of mineral spirits. It's always a good idea to pour varnish and oil through a paint strainer to remove impurities and undissolved residue. By gently wiping the surface with special cloths even very fine dust particles can be removed. Such useful, slightly adhesive cloths are available wrapped in foil from paint stores. Apply plenty of oil with a cloth, wipe off the excess after about 10 minutes and then allow to dry for several hours or overnight. Store the oily rag in an airtight closed container in between. Apply the oil and sand the wood while still wet (from the oil) with 320-grit wet/dry paper; wipe off any excess oil after 10 minutes and leave to dry for 24 hours. After finishing dry the oily rag out-of-doors (when wet it can self-ignite!) before you throw it away.